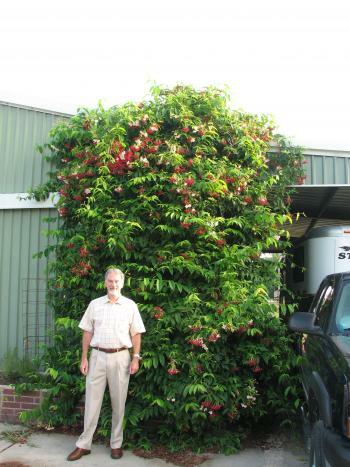 We just had to take a moment to write about this wonderful flowering vine. While the rest of us suffer under this summer’s heat and drought, Rangoon Creeper (Quisqualis indica) thrives in it! Lovely clusters of red/pink/white blooms hang down from these semi-evergreen vines. The blooms are incredibly fragrant at night. An added bonus is reports of deer resistance! Rangoon Creeper-A Houston Garden Must Have! The Rangoon Creeper is a perennial. It will die back in the winter. It does not bore into the wood, it would definitely need to have supports to climb. There are several alternatives, especially if you would like to have evergreen foliage. Come by and let us show you! We have planted 5 rangoon creepers against a 4 ft fence. We have realized that we'll have to change the fence to something taller in order to provide adequate support. Would a 6-8 ft fence be adequate? Does the vine have to be trained in some way or will it secure itself to the fence? They are still quite small, in the 2 ft range, but growing vigorously. Marlene, Rangoon creeper is a large growing vine. You will have to provide support, it does not attach itself to the fence. Space them at least 6' - 8' apart. They can freeze back in the winter but are root hardy. My rangoon creeper is about 3 years and has not bloom since it was planted in the ground. what should I do for it to bloom? Rangoon Creeper needs full sun and not too much water. Make sure it is well fed with an organic time released fertilizer. Rangoon Creeper does not like too much water. We carry them here at The Arbor Gate! We would love for you to come see us. Dave's Garden blog lists vendors for any plant you search on his site. Love my Rangoon creepers! Good luck! Will Ragoon Creeper take full sun including hot west sun in Houston? Thank you much! Yes, Ragoon Creeper will definitely take our hot west sun! Will Ragoon Creeper bloom in part sun in Houston? Thanks for the question Vicky! It needs at least 6 hours of direct sun to bloom well. I have a rangoon creeper on a very shide of my ash tree, and it has bloomed a little. I just bought another one last year and planted on the other side, under the tree, but where it receives more sun. It is already blooming and sending out dozens of buds. I just have it on the wooden trellis that came in its pot, but it is only about 5 feet tall now.It is an unusual vine in that when the flowers are new, they are white, then go to a pink and finally a deep pink. Most blooms will have all three colors on it. Don't deprive yourself of this beauty. We did not have a freeze this year, but some of the leave on my rangoon creeper look a little not really brownish but just a little strange. Should I trim it back? Patsy, That sounds like typical "winter look" even though we did not get very cold this winter. It will drop that foliage. It never hurts to prune. I would wait until all danger of frost has passed. Vicky, Rangoon creeper does go dormant in the winter. Cut the stems back until you see green inside the stem. Finally, my Rangoon creeper bloomed after vinegar, Epsom salt and miracid. Then no more blooms. Does it bloom only once? I'm back to feeding it or killing with the above regimen! Help! When does Rangoon creeper bloom? Blooming can be affected by age of the plant, training of the vine (wrapping not running), feeding and ample sun.